I found a book yesterday called the Book of Aquarius by Anon. I’m a good couple of years out of date finding it since it took parts of the internet by storm as a plainly written how to do it book on The Philosophers’ Stone. It can be downloaded for free if you Google it. Its quite well thought of in some quarters and, by many accounts, is the real deal. So what then is the Prima Materia for our Magnum Opus? Yes, that’s right – urine. Not any old urine – it has to be yours and it has to be collected at the right time. But it is Urine. From said Urine comes the Philosopher’s Stone. Yes, the thing you can live forever with or turn Lead into Gold. Now, while I am being sarcastic here. There is some evidence that in fact, Urine IS the Prima Materia hidden so obliquely by many alchemists. Having discovered this, I started doing a few Google searches to see if anyone had managed to turn their pee into some magical substance that cured everything and made you ageless. I discovered of course that there is a line of thought that urine is the Fountain of Youth. Apparently, it’s no accident that your little angelic statues sit peeing into waterfalls and pools globally – this is a hint. A hint that urine is it. Drinking your own urine is the cure all that kills cancer, and keeps you healthy. Rubbing it into your skin keeps you young looking (if a bit smelly!). 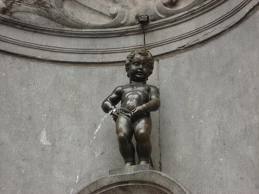 There are books and websites dedicated to urine drinking. Before I go ahead and give it a try…… do any of you DO this? Previous Post So what am I Then?